When you hear of butcher knives, you must probably image a big man with beard holding a big blade butcher knife in his hand slicing through the meat. Hover, now-a-days even home cooks who love to hog on meat used butcher knife for easy kitchen tasks. 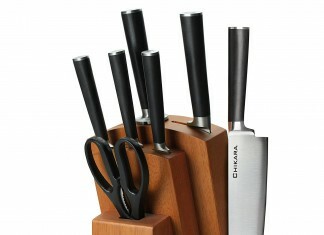 Butcher knives are a must-have in the kitchen if you cook meat on an everyday basis. 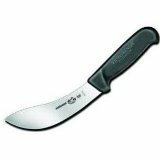 Butcher knives comes in various style, sizes and shapes which is why it is essential to consider a few factors while searching for the best butcher knives. Apart from quality, there are various things that you should know about these knives. 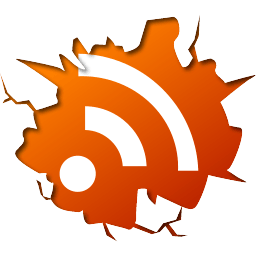 Let’s explore the different aspects that will help you find the best one. The best butcher knives offer a lot of help in various prepping tasks and are versatile in nature. Also known as scimitar and cimeter, it comes with a blade of 10 to 12 inches long and is used for slicing, cutting and trimming meat. This knife is the mostly preferred by butchers to cut large pieces of meat into retail cuts like steaks. Not only this, the butcher knife is also helpful in cutting potatoes, onions, watermelons and other tough vegetables and fruits. The butcher knives will be flexible, have razor sharp blade and offer a good grip on the handle. Boning Knife: It helps in slicing and cutting the meat from the animal bone. Skinning Knife: This knife helps in skinning beef and sheep. Meat Cleaver: This knife helps in chopping the pieces of meat or for breaking the bone. Butcher knife: This knife helps in cutting large chunks of meat into retail cuts as steaks. 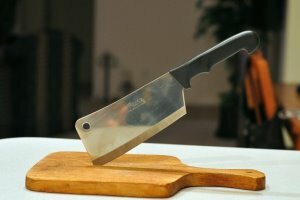 Since there are so many butcher knives available in the market, therefore here are a few pointers that will help you to choose the best butcher knives. First thing that you should look for is comfort. A butcher knife should be comfortable to use. 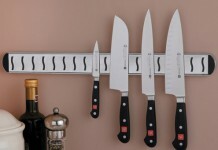 The butcher knife should fit your hand, provide secure space between your hand and cutting surface and should be sturdy. 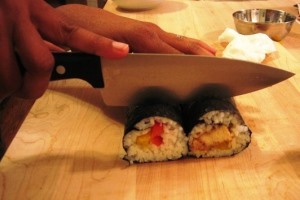 It should have a good balance and should be heavier than other kitchen knives. 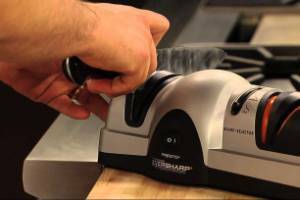 Always look for stamped or forged steel while purchasing butcher knife. Make sure the handle of the knife is made of rosewood, or any other wood or polymer. Do not forget to examine the tang that connects the blade and the handle. Since ages, this knife has been popularly serving butchers, BBQ pit boys and chefs with its exceptional cutting and slicing of meat. With no frills, this butcher knife offers high carbon steel blades that are heated and tempered for giving razor sharp cutting edge. Though it lacks rust resistance composition on the stainless steel, this knife can be sharpened easily using a knife sharpener. It also offers a flame burnt hardwood handle, waxed and buffed to give an antique look. It is also polished with brass rivets and “Old Hickory” brand tag. This knife is made from surgical grade stainless steel and is hand sharpened proving to be one of the most preferred butcher knife in the home kitchens. It is lightweight, sharp and convenient to use. With a black resin, stainless steel handle along with 7 ¾ inch long blade, this knife is very much suitable for stripping, splitting and cutting big portions of meat. It has perfect balance which helps in cutting and processing anything easily. This knife has proven to give its best in butchering beef and poultry with ease. This curved beef skinning knife is made up from high carbon stainless steel and is known for its durability and sturdiness. 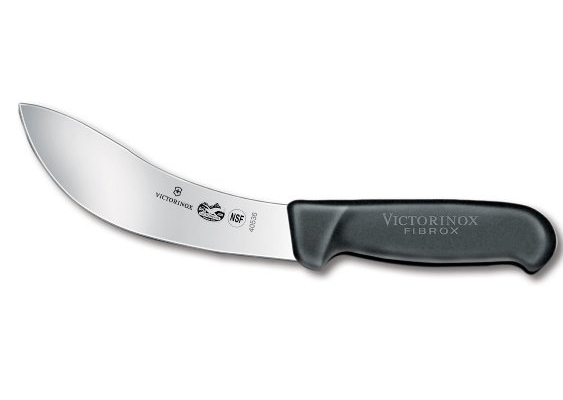 With a black ergonomically designed fibrox handle, this knife offers a strong grip and is hygienic and slip resistant. What makes this knife exceptional is its finger guard. Easy to clean, this knife offers maximum sharpness and edge retention. This exceptional butcher knife features a high carbon stainless steel blade and is hand finished. The edge of the knife is prepared by using a special tempering process which allows it to be re-sharpened over and over again thereby keeping its original sharpness forever intact. It has a blade that has been stamped with cold-rolled steel. It’s ergonomically designed handle helps in reducing wrist tension and offers a natural fit. It comes with common features like good heft and comfortable grip but what makes it exceptional is its sure-grip with finger guard. 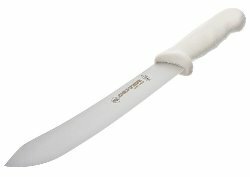 This knife helps in easy cutting and other butchering tasks and is ideal for cutting roasts and big cuts of meat. These knives are NSF approved and offer ease and convenience to cooks in kitchen. This knife doesn’t offer you the sleek design, style or color but focuses on superior quality products. This knife has a sharpened and hand-honed stainless steel blade with a Grip-Tex handle, offering durability, razor sharpness and ability to slice large brisket and roast in perfect and even thin portions. 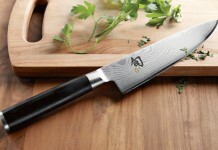 The perfectly honed blade and fit of the handle makes it a balance butcher knife for one and all. In a nutshell, this knife is sharp and larger than other butcher knives and works perfectly well for everyone.